NISHINOMIYA, HYOGO PREF. – Sixty years have passed since Roberto Barbon touched down in Japan for the first time in what he thought would be a two-year stepping stone on the way to playing baseball in the major leagues. A native of Cuba, Barbon arrived in February 1955 to join the Hankyu Braves, the forerunners of the current Orix Buffaloes, for whom he still works. Barbon was Nippon Professional Baseball’s first Latin player, a 21-year-old whose dream of playing in the big leagues was something his Japanese teammates could not share. His stay became a lifetime, during which the country’s game became exposed to the world and young Japanese men now grow up sharing the dream of playing in the majors that brought him here in the first place. Barbon, known everywhere in Japan as “Chico-san,” said he was discovered by legendary baseball man Al Campanis, who signed him and sent him to play in North America in the Dodgers organization. There the boy who idolized late Cuban outfielder Minnie Minoso got as high as class C, a few rungs below the majors. After hitting .283 in a 1954 season split between Hornell, New York, and Bakersfield, California, the Dodgers wanted to send Barbon to Tennessee, back to class D in the racially segregated South. Fed up, he wanted to go back to Cuba, but instead got an offer to play for Hankyu. At Hankyu’s training camp in Kochi, there was also snow on the ground, and his new teammates were practicing in it. “I said, ‘I can’t play ball here. It’s too cold. I’m going,” Barbon said. But instead of leaving, he made an impact. In his debut season, the second baseman stole 49 bases and became the first Pacific League middle infielder to score 100 runs in a season. 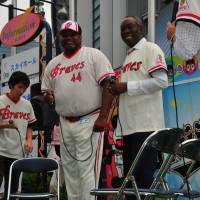 Barbon built an impressive career in the Pacific League, playing in 1,353 games over 11 seasons, the first 10 with the Braves and his final one with the Kintetsu Buffaloes. After that he worked as a coach and then an interpreter. During that time, the amiable Cuban said he was never ejected — although one reason might have been the language barrier. He learned Japanese, however, and eventually had to deal with Hall of Fame catcher Katsuya Nomura distracting batters by constantly talking to them. And though the PL was loaded with stars, the schedule was hard, train travel was slow, double headers were frequent and fans were scarce as baseball played second fiddle to professional wrestling. Japan’s wrestling boom was inspired by the stage-managed heroics of a Korean former sumo wrestler, Rikidozan, who was promoted as a Japanese hero. Barbon got a taste for wrestling’s popularity when he remarked to a writer that Rikidozan’s matches were obviously decided in advance. His comments ended up in the paper, and Rikidozan, who had strong organized crime connections, was reportedly furious. But that was an isolated incident in what has been a joyful existence. “I love this country,” said Barbon, who now conducts youth baseball clinics for Orix and whose principle advice to new guys here is to just get used to things.